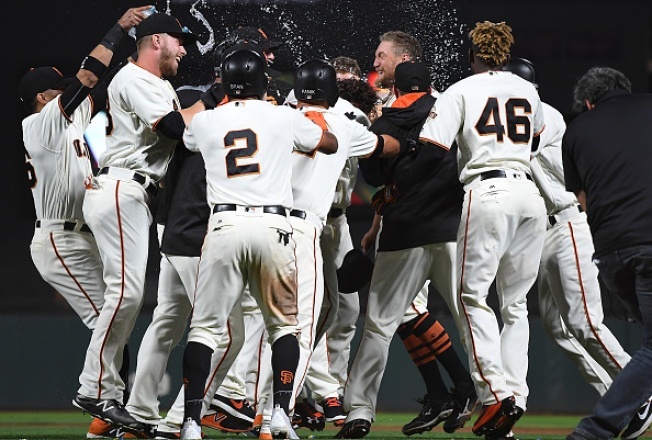 SAN FRANCISCO — Johnny Cueto brought the fun. Hunter Pence brought the thunder, and the game-winner. Four innings after a go-ahead homer, Pence’s sacrifice fly to right-center clinched a 4-3 win over the Rockies. The win was No. 59 on the season, and gave the Giants a little breathing room as the 100-loss mark approaches. Pablo Sandoval led off the bottom of the ninth with a roller that went for an infield single. He was replaced by pinch-runner Orlando Calixte, and Calixte went to second when Ryder Jones pushed a bunt for a hit. Kelby Tomlinson followed with a pinch-hit single to right and Pence ended it. —- Cueto might have provided the funniest moment of the season. He was on first when Pence homered, and as Pence came roaring around second, Cueto — in a black jacket — looked back and told him to slow down. The two then went the final 90 feet of the go-ahead shot in a fast-walk. It must have been an odd moment for Full Throttle. —- Cueto’s pitch count got up early, but he used double plays to get kind of deep. In 6 2/3 innings, he allowed two earned on seven hits and four walks. He also struck out six. The outing was Cueto’s longest since June 24. —- Pence’s homer was his 12th, and went 444 feet to dead center. That’s Pence’s longest homer of the season. He’s now tied with Buster Posey for the team lead among right-handers, and he’s one homer behind Brandon Crawford for the lead among active Giants. —- Sandoval is coming out of one of the worst slumps in franchise history. He had three hits, including an RBI single. On Sunday, Sandoval had two hits. —- Hunter Strickland blew the lead in the eighth. With a running on second, he got away with a hanging breaking ball that Nolan Arenado hit to the track. The next guy, Gerardo Parra, fouled off six pitches before roping a tying double into the right field corner.